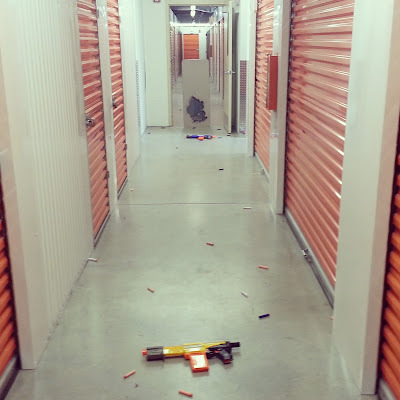 Fired a few darts from my original Nerf N-Strike Alpha Trooper CS-18 and the new Nerf N-Strike Elite Alpha Trooper CS-12, and here's what I got. From where I was standing, the original shot about 30', while the Elite Alpha Trooper hit around 50', at a pretty flat angle. Full review is being worked on! Where the blasters lay denotes the cluster; original closer to camera than the Elite. The one Elite dart near the original was a ricochet that bounced back.